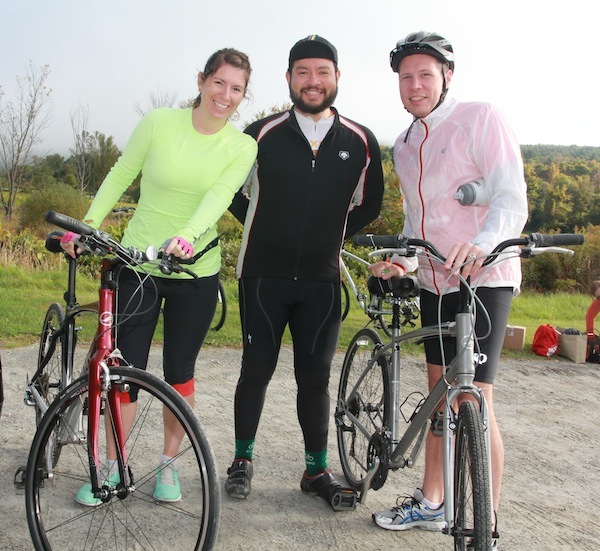 From left: Jacqueline Farinella, Juan Saucedo and Justin Kitchens from Team Sutherland at the Pedal for Peace start line outside Barrington Brewery in Great Barrington, MA. Justin’s friend Juan Saucedo, an avid cyclist, recently moved to from San Francisco to New York City (where Justin currently lives). 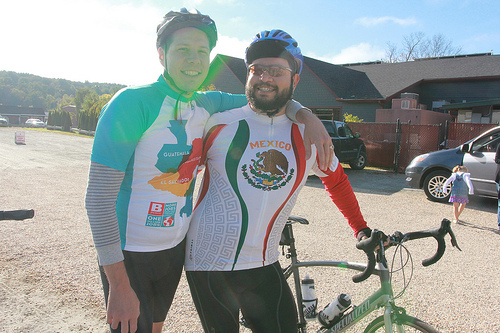 Since relocating, Juan has been encouraging Justin to start cycling. For Justin, Pedal for Peace was a great chance to spend time with friends. “We wanted to get out of the city and take in some rural scenery and explore the countryside,” he says. At Bpeace’s 2013 Annual Meeting, Justin Kitchens (right) receives the Extreme Cycler Award for being the top Pedal for Peace fundraiser. 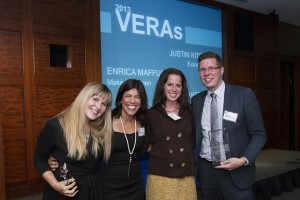 Award presented by Bpeace Board Director Mary Ciampa (second from left). Also pictured: Volunteer Excellence Recognition Award (VERA) winners Jamie Mittelman (second from right) and Enrica Maffucci (left) honored for their work in making our 2013 Pedal for Peace ride the largest in Bpeace history.Excited about the ride, Justin signed up and began fundraising. Attracting over 25 individual donors, he raised nearly six times his original goal of $500 in less than 10 days! 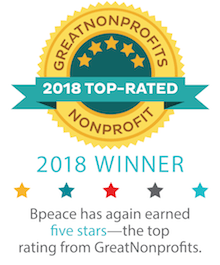 The support of Justin’s Sutherland colleagues was “overwhelming.” He believes it was "because Bpeace’s mission resonated with the firm’s employees.” Justin also had a passionate advocate in Cynthia. With fundraising in the bag, Justin enlisted Juan to help him train. The two did a few practice rides around the city building up to the race. Justin felt prepared. But little did hen know that New York City bridges were no match for the not-so-gentle hills of the Berkshires. From left: Jacqueline, Justin and Juan stretching and getting ready to start the ride. 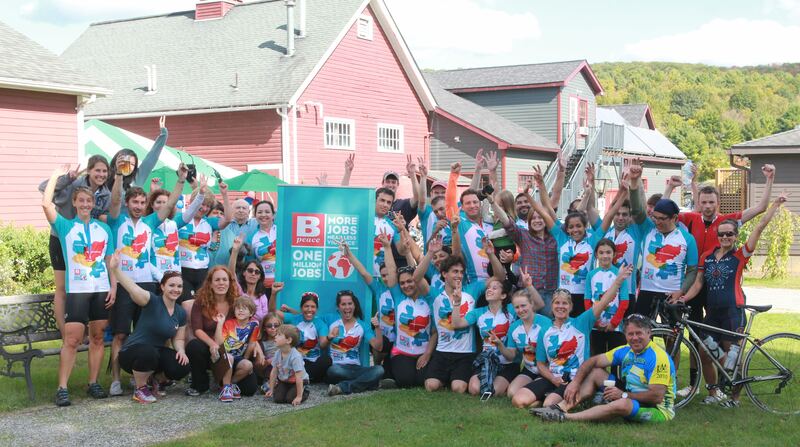 The morning of September 28, 2013, Justin, along with 43 other cyclists including teammates Juan and Jacqueline Farinella, pedaled for peace through the Berkshires. For Justin, it turned out to be more than a simple 50-mile ride. Early on, he and Jacqueline got lost and were separated from Juan. Then Justin’s bike broke. Fortunately, a friendly farmer helped fix it. The course wasn’t easy with several large and steep hills. But the goal was to ride 50 miles and, most importantly, to have fun. They did both. When Justin and Jacqueline pedaled across the finish line, Juan was dutifully waiting for them to celebrate. 2013 Pedal for Peace participants at the finish line at Barrington Brewery in Great Barrington, MA on September 28, 2013.